A Large and Impressive French 19th Century Onyx and Ormolu Mounted Orientalist Style Figural Urn, Attributed to Eugène Cornu (French, d. 1875) and G. Viot & Cie. 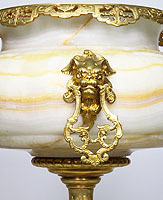 The single ovoid onyx urn surmounted with lion masks attached to handles, the top rim with a pierced ormolu apron, on four cabriolet feet. Circa: Paris, 1860-1870. During the second half of the 19th Century, due to the West's expanding colonies and subsequent trade in the East, new materials and a new decorative vocabulary were introduced which inspired productions that went beyond the standard repertoire of revival-styles. 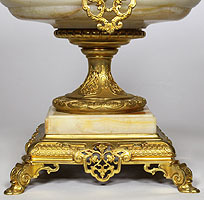 The public hunger for these type of goods is exemplified by this and other impressive and luxuriously ornamented vases that were being acquired by wealthy individuals from arounf the world. Porbably designed by the sculptor Eugène Cornu and manufactured by G. Viot and the Compagnie des Marbres Onyx d'Alegérie, the orientalist ormolu decoration reflects the taste fuelled by the exotic wares shown to the public at the Indian, Chinese, Turkish, and Egyptian pavilions of the International Exhibitions during the mid-19th century. 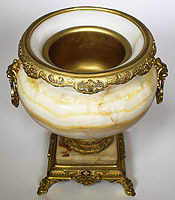 The partnership between the sculpteur Eugène Cornu (d. 1875) - who owned marble and onyx mines in Algeria - and Viot, created luxurious objects and furniture incorporating marble, gilt-bronzre and in many cases decorated with enamel champleve. Onyx, known since antiquity and used by both the ancient Egyptians and Roman civilisations, was first shown in modern times at the 1862 International Exhibition in London to great acclaim, having only been re-discovered in 1849 in Oran, Algeria. Cornu supplied his Algerian Onyx, through Viot, to other sculptors such as Charles-Henri-Joseph Cordier (d. 1905), celebrated for his images of Orientalist figures and busts, as well as Albert-Ernest Carrier-Belleuse (d. 1887). 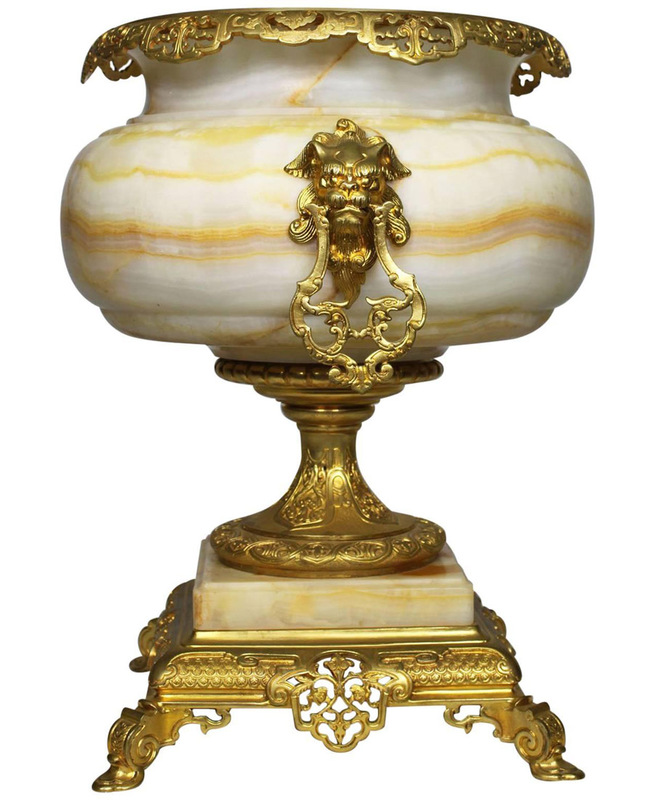 A Large and Impressive French 19th Century Onyx and Ormolu Mounted Orientalist Style Figural Urn, Attributed to Eugène Cornu (French, d. 1875) and G. Viot & Cie. 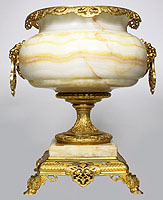 The single ovoid onyx urn surmounted with lion masks attached to handles, the top rim with a pierced ormolu apron, on four cabriolet feet. Circa: Paris, 1860-1870. During the second half of the 19th Century, due to the West's expanding colonies and subsequent trade in the East, new materials and a new decorative vocabulary were introduced which inspired productions that went beyond the standard repertoire of revival-styles. The public hunger for these type of goods is exemplified by this and other impressive and luxuriously ornamented vases that were being acquired by wealthy individuals from arounf the world. Porbably designed by the sculptor Eugène Cornu and manufactured by G. Viot and the Compagnie des Marbres Onyx d'Alegérie, the orientalist ormolu decoration reflects the taste fuelled by the exotic wares shown to the public at the Indian, Chinese, Turkish, and Egyptian pavilions of the International Exhibitions during the mid-19th century. The partnership between the sculpteur Eugène Cornu (d. 1875) - who owned marble and onyx mines in Algeria - and Viot, created luxurious objects and furniture incorporating marble, gilt-bronzre and in many cases decorated with enamel champleve. Onyx, known since antiquity and used by both the ancient Egyptians and Roman civilisations, was first shown in modern times at the 1862 International Exhibition in London to great acclaim, having only been re-discovered in 1849 in Oran, Algeria. Cornu supplied his Algerian Onyx, through Viot, to other sculptors such as Charles-Henri-Joseph Cordier (d. 1905), celebrated for his images of Orientalist figures and busts, as well as Albert-Ernest Carrier-Belleuse (d. 1887).